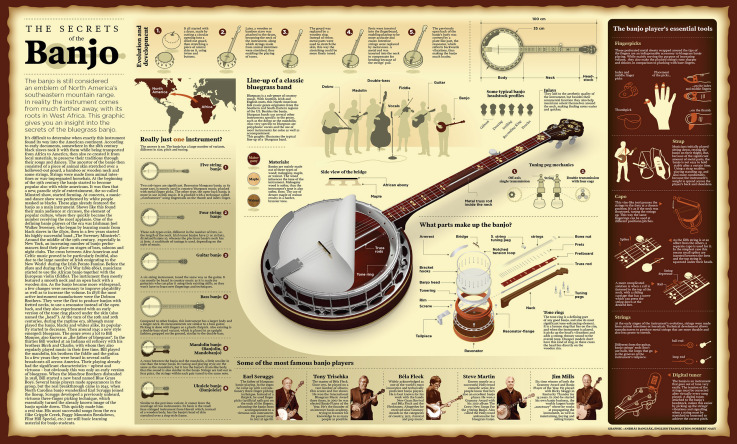 Thanks to András Dancsák, a Hungarian graphic designer and banjo player, who sends news of his latest work: the Banjo Infographic. This is a high-resolution graphic design (see above) which gives - under the title 'The secrets of the banjo' - a sectional view of a 5-string resonator banjo; the banjo-player's 'essential tools' (picks, sling, capo, tuner, etc. ); an outline of the development of banjo construction; the other instruments of the banjo family; the lineup of a classic bluegrass band (all six instruments); a selection of famous players (Earl Scruggs, Tony Trischka, Bela Fleck, Steve Martin, Ron Block); and much more information.